He is gonna have soooo many ticks when he gets up out of there. This is really cool! So calm and relaxing. I'm sure Link's having fun playing the Ocarina in there. Aww, thank you! I appreciate that. and I can see that Link is enoying to here. I would to, especially if I would be lying there too. I love the forest. Same here. There's just something about the untouched wilderness, a beauty you can't find anywhere else. 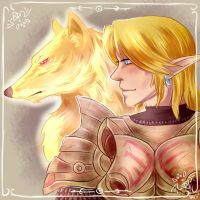 Wow, The soul of Ocarina of Time and that melody is fantasic. Link looks so chill and the lightning in the picture.. kinda.. lift up.. Idk how to explain it. It´s Fantaastic. It´s good to see you back here again and with amazing art. I thought you stoped to draw. A clear and a for the effert and good art! Ahh, it's good to see you again, too! Thanks so much for all your kind words, I'm so glad you like the new Zelda pic! I did stop drawing for awhile. I got really sick for a long time. I'm back at it, now, though! Ooh, you're the first one to mention the flowers! How wonderful! I chose each one specifically for the symbolism and folklore surrounding them. Thank you, that's great to hear! Aaah, thank you, that is so nice to hear~! Thanks! The pink ones were really fun to do. This is so beautiful! Amazing job! Really pretty have missed seeing your art it is so good. I hope everything turns out well I wish I could help support if I had money. But I pray for the best! Thank you~! I've been drawing a lot more lately. Pupper had a very good day today. Hoping all the tests and medication will finally help! Of course! Your art is super beautiful and I always enjoy seeing it so it is very nice to see the return. And that's wonderful to hear I pray and hope for the best always.